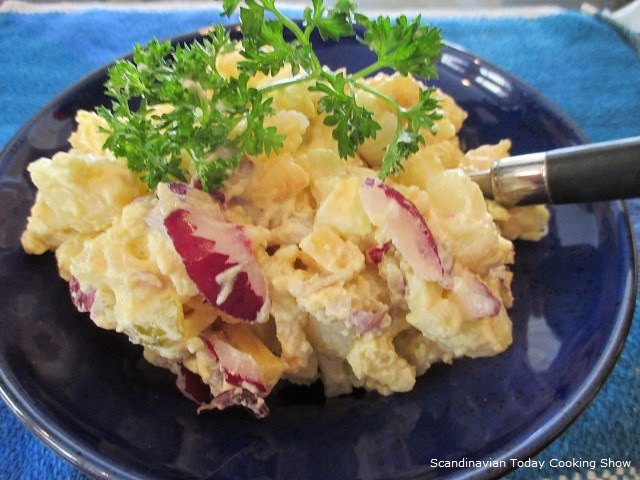 The Icelandic Potato salad is a delicious and filling dish that is perfect as a side for meat dishes such as steaks. However we think it is so good it is perfect as a side dish to a sandwiches or for summer picnics too. If you want to know how to make this potato salad, just follow these steps. to see how the Kare Grete prepares this delicious salad! 1 ) mix the prepared ingredients: potatoes, eggs, pickles, and one apple into a big bowl. Add a portion of the red onion and stir well. The other portion we will use the onion as garnish. 2) next add half a cup of Icelandic yogurt and half a cup of mayonnaise. Toss the mixture well until the ingredients are thoroughly blended and the salad has a rich, creamy consistency. 3) add a dash of curry powder, lemon juice (if using), salt and pepper to taste and stir well. Add more salt, curry or mayo as needed. 4) finally garnish with the second chopped apple and remaining chopped red onion. Then add parsley on top of the salad. This gives the salad wonderful color. Cover and refrigerate for a few hours. This will allow the ingredients to blend. 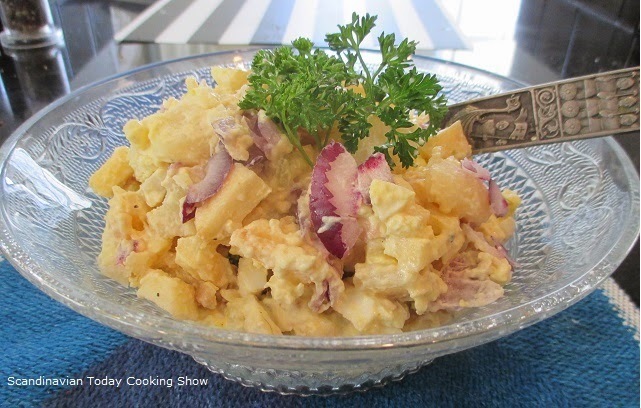 You can serve this tasty potato salad cold or at room temperature. Previous Post Finnish Blueberry Yogurt Pie – Mustikkapiiras – Super Easy To Make!